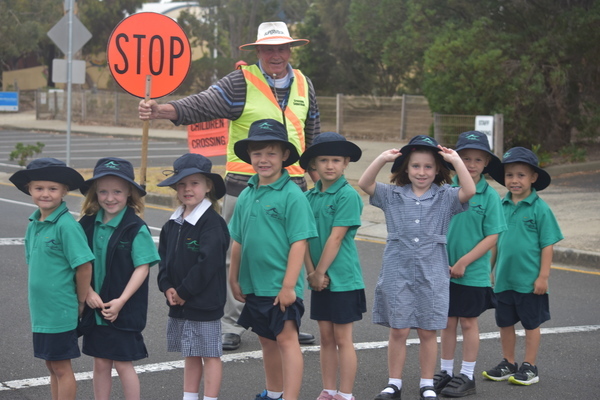 New Surfside Primary prep students were given a valuable road safety message from its master school crossing supervisor, Jack Murphy, to commence the 2019 school year. Foundation-year pupils were taught positive behaviours in the community, with road safety a key pillar, according to school wellbeing coordinator Gill Hodgson. “It’s part of our school positive behaviour, teaching the kids all about safety; safety in the background, safety when we are out in the community, and also showing respect to Jack, who we love and adore,” Gill said. Jack said he developed a bond with many generations of Surfside Primary students at the school crossing. “You see them start in prep and then they finish up at the secondary college at the back. Then I run into them down the street or at the football ground,” he said. Jack, a school crossing supervisor at Surfside Primary since 1999, confirmed that the traffic along John Dory Dve was much busier now then when he started in the role. The extension of John Dory Dve and the inclusion of a roundabout which bends around to the east side of Surfside meant more cars were on the road during morning school drop off times, he said. “This year and the last year is the busiest I have had it. There’s more kids, there’s more traffic.